My website features the best Scotland / Oakland real estate search for homes, condos, land and multi-residential properties available. It is the only site you will ever need! It is easy-to-use and updated by the official MLS database every 15 minutes. You can save searches and get daily email alerts of new listings, price changes and market reports. My Interactive Map Search allows you to view properties on a map, or refine your search by drawing the boundaries around the area you desire. Scotland and Oakland, Ontario are two small Villages located approximately 20 minutes South of Brantford. These two smaller areas are considered rural communities with no real town centers. Major shopping and amenities can be found in either Brantford, or Simcoe. The outlying areas are used predominantly farm production and people that live here will surely know your name. Scotland and Oakland are two sleepy communities for those who are interested in a peaceful and quieter lifestyle while still being close enough to major centers. The area appeals to Home Buyers who wish to know and help their neighbours and to feel part of a small but tight-knit community. 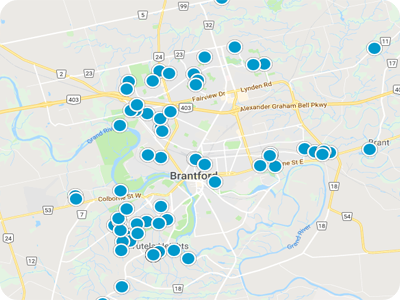 Our site Property For Sale in Brantford, provides real-time MLS Listings that are updated multiple times per day to ensure our clients are the first to know about any active listings in the Scotland and Oakland areas.